Everyone, meet Bonnie. Bonnie, meet, EVERYONE! Getting ready to PR her 5K this past weekend- it’s the Sparkle Skirt. 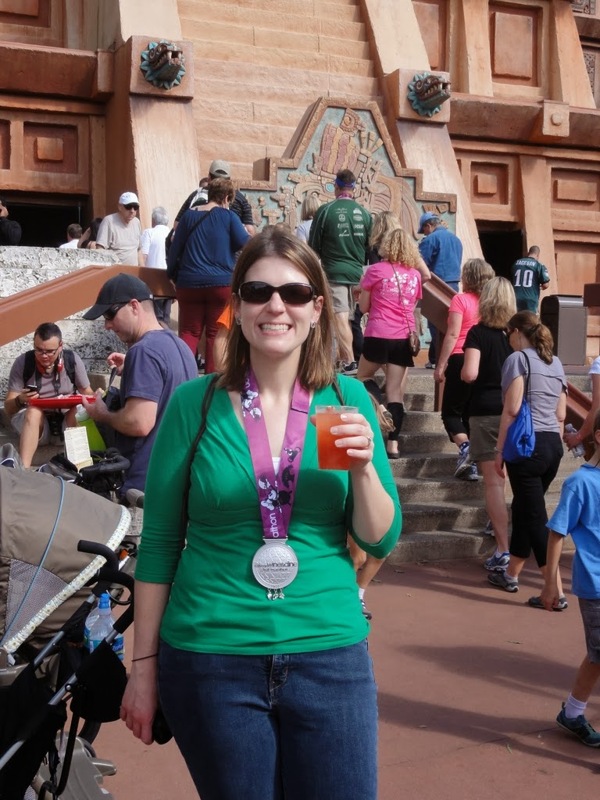 Now that the Tower of Terror 10-Miler weekend is over, I’m ready to focus on the next event on my racing calendar: Wine and Dine! 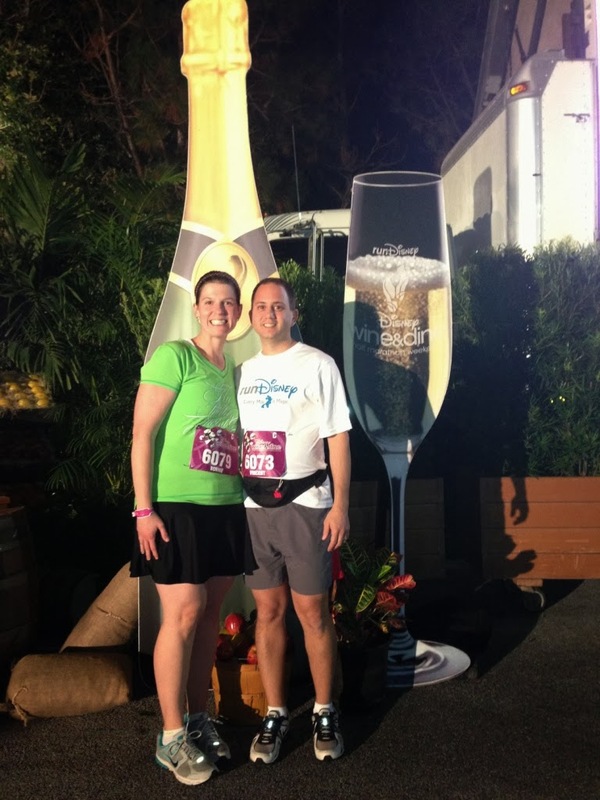 My great friend Bonnie, is sharing her experiences with the 2012 Wine and Dine Half Marathon today. We met online, fell into friendship, and (don’t tell anyone- but she’s my favorite!) She calls herself the DisBroad Groupie, and we all just adore her! 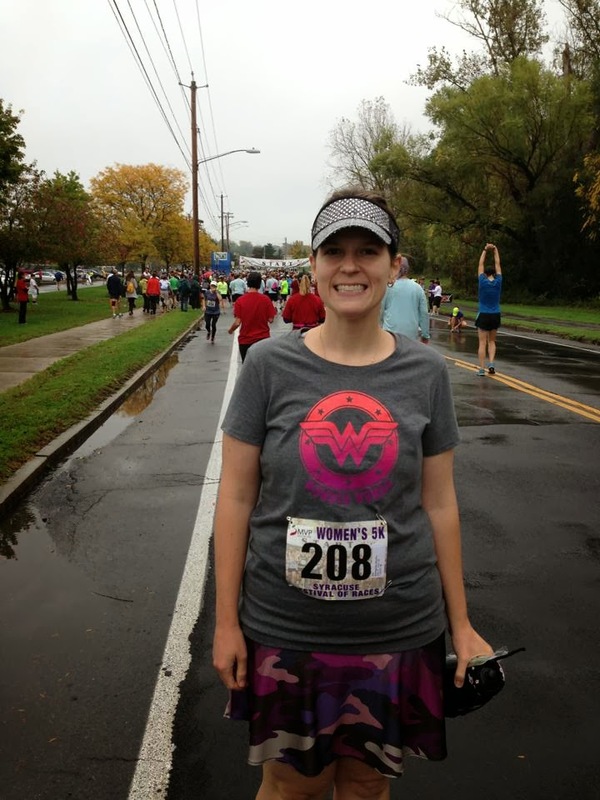 Bonnie’s a mom of 2 adorable kiddos and an awesome runner who just PRed her 5K this weekend in the cold and rain. Go Bonnie! She doesn’t have her own blog (at this time– the DisBroads keep encouraging her to get her voice out there!) but she agreed to share her experiences with all of us today. Who?s Excited for Wine & Dine?! I know I am! I am running the 2013 Wine & Dine HalfMarathon with the Disbroads! I am so excited to have a girls? weekend at Disney and to finally meet all my new friends in person. 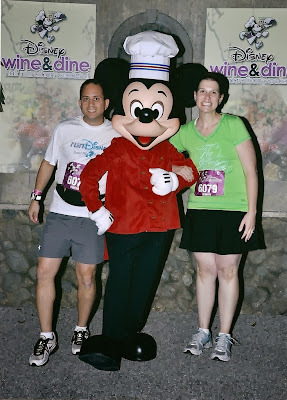 Patty invited me to write a guest post recapping my experience at last year?s Wine & Dine to get you all pumped for this year?s race. 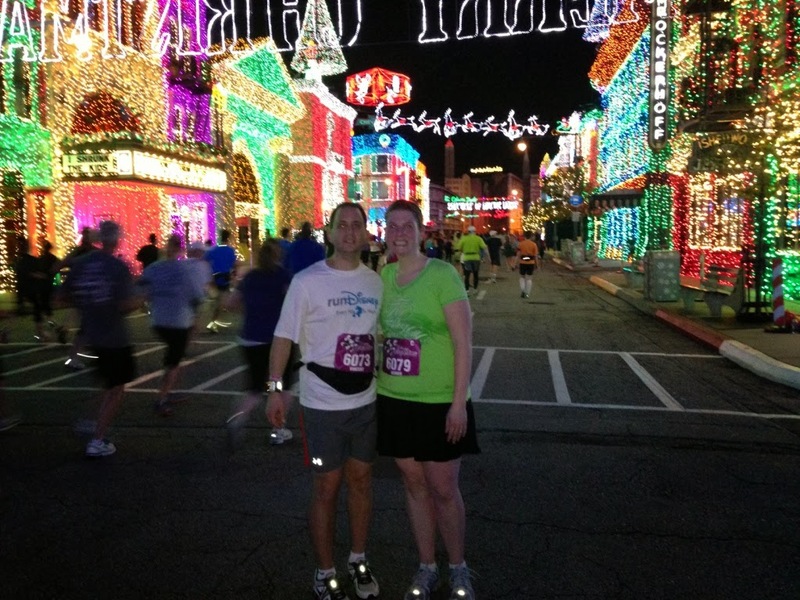 Last year was special to me because it was the first race I ran with my husband. It was his first half marathon and we had a great time running together. I will say that the idea of a night race worried me a bit. I am not one to stay up all hours of the night but rather have been known to doze off on the couch by 10pm. This race doesn?t even start until 10:00! Would I be able to stay awake? Would I have enough energy to get through the race? The answer to both questions was yes. We took it easy the day of the race. We didn?t do anything besides packet pickup. We even took naps. I was nervous the whole day though. It was weird for me to wait all day for race time. I was so used to having everything over by 10:00 am and enjoying the rest of the day at the park. This was the complete opposite. The anticipation lasted the whole day. We were ready to go to the race by 7:00 pm. I just couldn?t wait in the room any longer! So we hopped on the first bus and off we went. We saw a long line of people waiting for something as soon as we got off the bus. After investigation, we realized it was Chef Mickey. We figured we didn?t have anything better to do, so we waited in line. And we waited. And waited some more. We waited about an hour to see him. Mickey was in constant need of a cheese and crackers ?break? every 30 minutes. There was a DJ playing right near the line getting everyone pumped up for the race. So that entertained us. But we were psyched to finally get our picture. We headed to the corrals after walking around a bit longer. You know how runDisney likes to get you in your corrals way before the race starts just so everyone is actually there by the time the race starts. So we waited in our corral a bit, probably an hour. I was a little chilly waiting there. I brought a throwaway long sleeve shirt so I wore that. Mind you, I am from Central New York where we are used to the cold weather. So any Southerners might be more than a little chilly waiting before the race. I raced in a skirt and a t-shirt and I was fine during the race, not cold at all. When 10:00 finally rolled around, we were ready to race! My wonderful husband decided to run with me even though he is much faster. I kept the pace when we ran. We did intervals using the Galloway method. When we walked I was actually much faster than he was. I tend to power walk whereas he was using it to rest a bit and therefore walking slower. But when my timer went off, he saw me start to run and did the same and caught up right away. So it worked out well. In general, I didn?t find the race to be too crowded. There were bottlenecks when the path narrowed like going into Animal Kingdom and over by the Boardwalk. But we were able to run together with no problems. We pretty much skipped the beginning photo ops and I don?t remember who they had for characters. I do remember the feeling I got when I saw the Tree of Life lit up at night. It was such an awesome sight. Not one you get to see at all on a regular trip since Animal Kingdom closes so early. It is really pretty amazing. After Animal Kingdom, we headed over to Hollywood Studios. I remember being super excited to see Wreck It Ralph even though we hadn?t seen the movie yet. I just knew it would be one that not only my son, but also my husband and I would like. And I was right. We love the movie. So it seems fitting that Ralph was our first photo stop on the race. His arms were so big that he just about knocked me over! 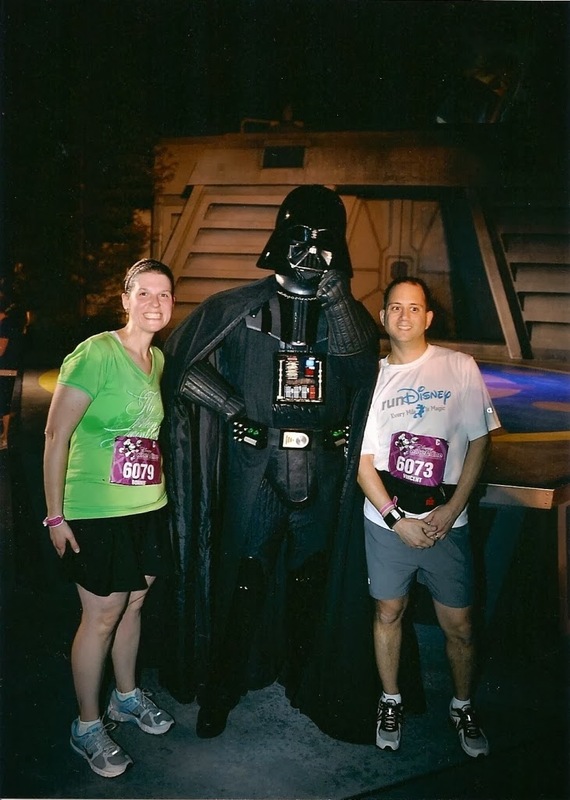 After Ralph, we stopped again to take a picture with Darth Vader. My husband loves Star Wars so it was a must stop for him. We waited in line about 5 minutes to see him. I have no idea where my husband is looking here. After that, we just kept on running. Remember when I thought I wouldn?t have the energy to finish the race? That wasn?t even an issue. The adrenaline was flowing and got me through the race even though it was way past my bedtime! We got to Epcot and we knew we were close. We turned the corner and there was a laser light show. It was really neat. I thought it was the finish line, but it was actually just before. 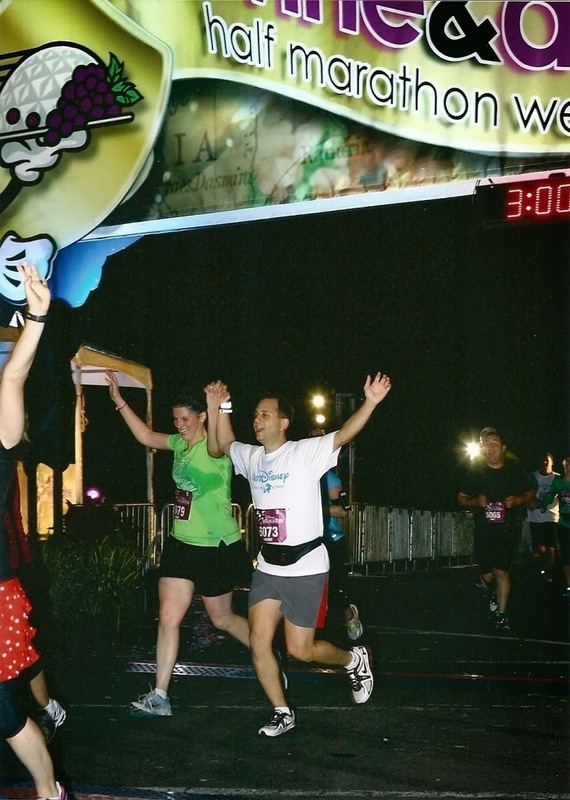 My husband grabbed my hand and we finished the race together. It was just awesome! My favorite race memory. Ever. 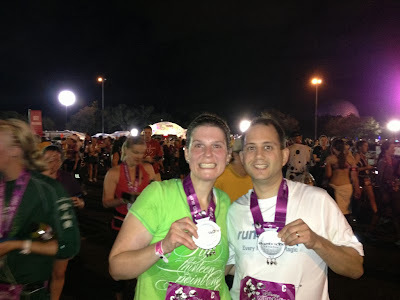 So proud of my husband and so happy I got to share a runDisney experience with him! Also awesome was the fact that there was a party waiting for us. It took us a bit to change and head over, but we eventually made it. We were quite tired though. 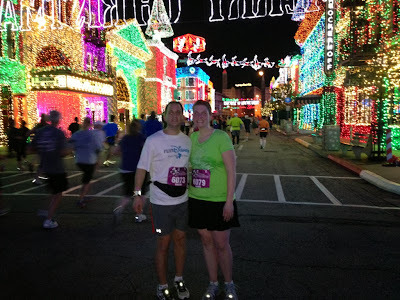 We used up our $10 gift card that came with race registration pretty quickly then walked around a bit. Our legs needed rest though. 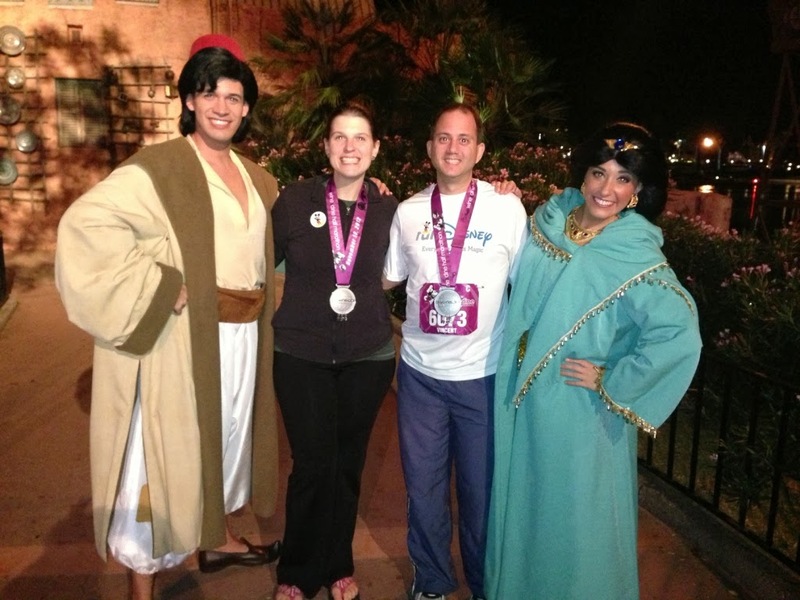 I was surprised we made it all the way back to Morocco to see Aladdin and Jasmine. Who knew Jasmine had cold weather attire? Not me! The sad part was that we needed to walk all the way back around World Showcase before we could go back to the hotel! 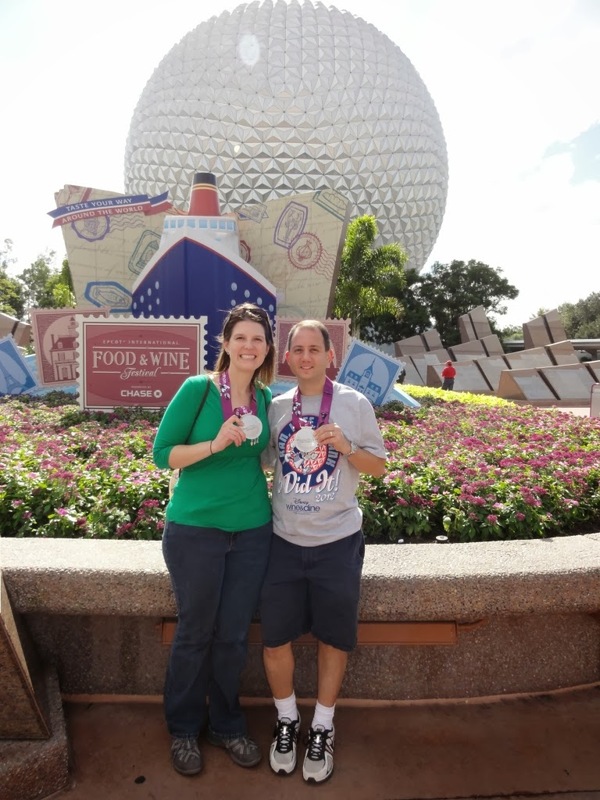 The next day, we made it back to Epcot. It was pretty cool walking around the Food and Wine Fest with our medals around our necks. Ready to enjoy the Food & Wine Festival. No guest post on Margaritas, Miles, and the Mouse would be complete without a margarita, right? In summary, Wine & Dine was an amazing time last year. My husband finished his first half marathon and he did it holding my hand. You really can?t get much better than that. He even told me he would consider more races in the future, especially ones at night, if it weren?t for those pesky 4 months of training ahead of the race. I?m working on him though. 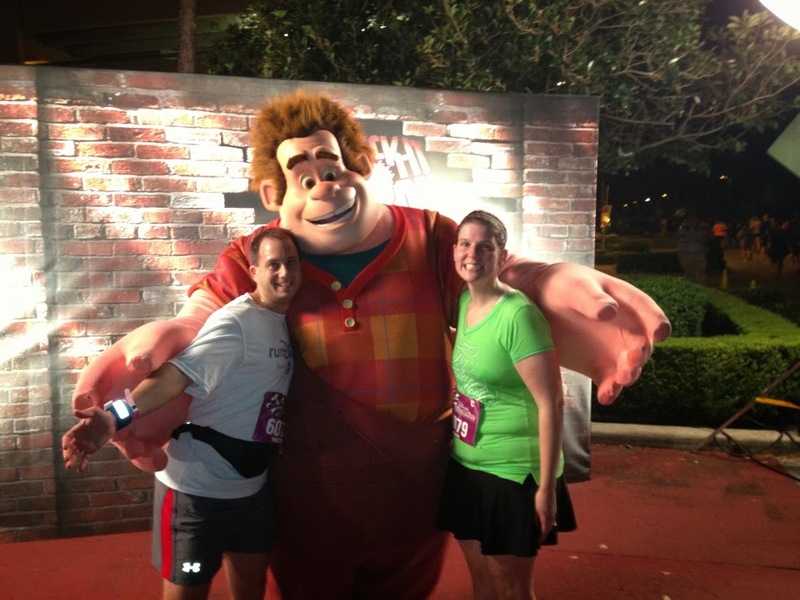 I think I have him talked into running a race at Dumbo Double Dare weekend at Disneyland next year so I can go Coast to Coast! Until then, just 31 more days until I run Disney again!! The Disbroads and I hope to see you there! Awesome post, Bonnie! So let’s hear it: Who’s excited for Wine & Dine Half Marathon?! Any goals for your race you want to share?